M T D F e b r u a r y 2 0 1 9 36 M o u n t i n g / B a l a n c i n g pounds and over. Most tire changers and wheel balancers are now available with tire lis to aid in liing from the floor to work height; it's a good investment for your shop and your employees' "wheel-being." Wheel lis on balancers also allow the operator to greatly improve centering on heavy wheels by negating the effects of gravity combined with tapered centering cones and spacers. Shop managers should train all operators to understand the importance of how to simply validate a wheel is centered before balancing. Hennessy, Vanderheyden: Computer balancers on the market today will dynami- cally balance a wheel. However, due to weight round-offs and slight weight replacement errors, they oentimes leave an excessive residual static imbalance. e ongoing pursuit of increased fuel economy will continue to increase vehicle sensitivity to vibration and drive the need for tighter balancing tolerances in aermarket wheel service. Tire innovations driven by the need for reduced rolling resistance will compound the ride quality challenges already faced in the aermarket. Hunter, Meyer: e first trend is come- back reduction. Many customers are begin- ning to understand the value in customer retention. When dealing with tires, this means the tires must be vibration-free the first time. Customers are investing in equip- ment that makes this easy. Tire changers like the Revolution that can automatically perform a bead massage ensure that tires are seated properly on rims and reduce road force and therefore vibrations. Having equipment like Hunter's Road Force balancer that can "test drive" these and fix problem assemblies before giving the vehicle back to the customer is critical. e second trend is ease of use. Techni- cian turnover is a real issue. 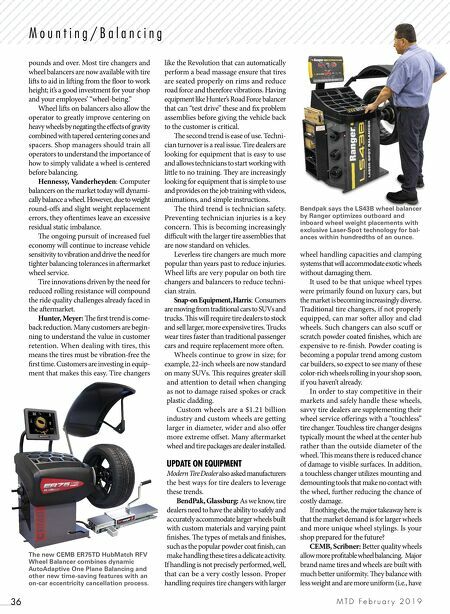 Tire dealers are looking for equipment that is easy to use and allows technicians to start working with little to no training. ey are increasingly looking for equipment that is simple to use and provides on the job training with videos, animations, and simple instructions. The third trend is technician safety. Preventing technician injuries is a key concern. This is becoming increasingly difficult with the larger tire assemblies that are now standard on vehicles. Leverless tire changers are much more popular than years past to reduce injuries. Wheel lis are very popular on both tire changers and balancers to reduce techni- cian strain. Snap-on Equipment, Harris: Consumers are moving from traditional cars to SUVs and trucks. is will require tire dealers to stock and sell larger, more expensive tires. Trucks wear tires faster than traditional passenger cars and require replacement more oen. Wheels continue to grow in size; for example, 22-inch wheels are now standard on many SUVs. is requires greater skill and attention to detail when changing as not to damage raised spokes or crack plastic cladding. Custom wheels are a $1.21 billion industry and custom wheels are getting larger in diameter, wider and also offer more extreme offset. Many aermarket wheel and tire packages are dealer installed. UPDATE ON EQUIPMENT Modern Tire Dealer also asked manufacturers the best ways for tire dealers to leverage these trends. BendPak, Glassburg: As we know, tire dealers need to have the ability to safely and accurately accommodate larger wheels built with custom materials and varying paint finishes. e types of metals and finishes, such as the popular powder coat finish, can make handling these tires a delicate activity. If handling is not precisely performed, well, that can be a very costly lesson. Proper handling requires tire changers with larger wheel handling capacities and clamping systems that will accommodate exotic wheels without damaging them. It used to be that unique wheel types were primarily found on luxury cars, but the market is becoming increasingly diverse. Traditional tire changers, if not properly equipped, can mar soer alloy and clad wheels. Such changers can also scuff or scratch powder coated finishes, which are expensive to re-finish. Powder coating is becoming a popular trend among custom car builders, so expect to see many of these color-rich wheels rolling in your shop soon, if you haven't already. In order to stay competitive in their markets and safely handle these wheels, savvy tire dealers are supplementing their wheel service offerings with a "touchless" tire changer. Touchless tire changer designs typically mount the wheel at the center hub rather than the outside diameter of the wheel. is means there is reduced chance of damage to visible surfaces. In addition, a touchless changer utilizes mounting and demounting tools that make no contact with the wheel, further reducing the chance of costly damage. If nothing else, the major takeaway here is that the market demand is for larger wheels and more unique wheel stylings. Is your shop prepared for the future? CEMB, Scribner: Better quality wheels allow more profitable wheel balancing. Major brand name tires and wheels are built with much better uniformity. ey balance with less weight and are more uniform (i.e., have Bendpak says the LS43B wheel balancer by Ranger optimizes outboard and inboard wheel weight placements with exclusive Laser-Spot technology for bal- ances within hundredths of an ounce. 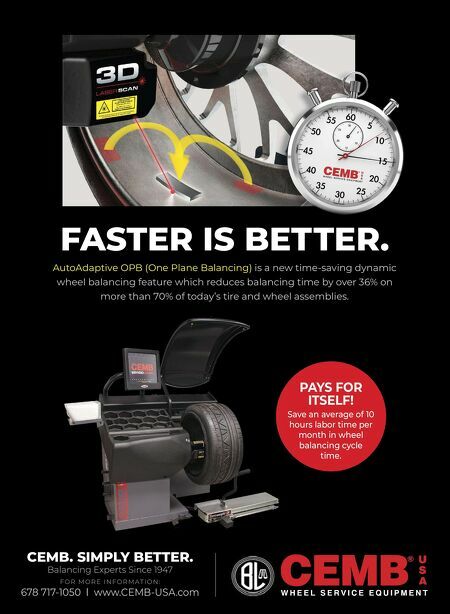 The new CEMB ER75TD HubMatch RFV Wheel Balancer combines dynamic AutoAdaptive One Plane Balancing and other new time-saving features with an on-car eccentricity cancellation process.